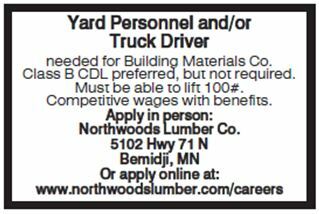 Yard Personnel and/or Truck Driver | Northwoods Lumber Co.
Yard Personnel and/or Truck Driver needed for Building Materials Co. Class B CDL preferred, but not required. Must be able to lift 100#. Competitive wages with benefits.